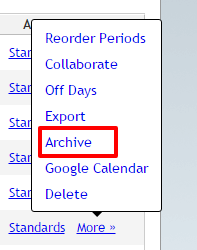 Archiving a planbook removes it from your default planbook list, but allows you to still view the plans. Generally, you would archive old planbooks that you no longer need to edit and only rarely view. any changes on an archived planbook. Once a planbook has been activated you will have all the normal options available and will once again be able to make changes.